Apartments from 41 sqm up to 138 sqm some of them with sea view. Forget about your daily cares and rest and relax while enjoying this grandiose region in an exceptional environment. Vence, located between the sea and the mountains, is a part of what is known here as the middle country: A true paradise for nature lovers. This intimate Residence is made up of only 34 flats in a preserved residential neighbourhood. TERRA, striving to provide a strong patrimonial character to its residences, works only with recognised partners to offer you the best services. With modern, aesthetic and ecofriendly architecture, Miramar Terraces offer top quality features. 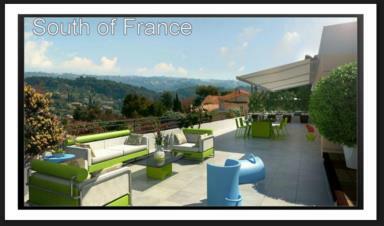 Most of them have a large terrace where you will enjoy an exceptional panoramic view. Support buyer : Book a Travel and visit in South France, meeting with the developer.